Recorded in Puerto Rico with top studio musicians, the Spanish music on this album brims with energy, joy and rhythm—all typical of that island and its rich musical heritage. This guitar accompaniment features chords and vocal parts for the music album Del Pesebre a la Cruz by Diego Correa and Damaris Thillet. Additionally, the original texts are written entirely in Spanish. Introducing Diego and Damaris! Puerto Rican natives based in New Jersey, this dynamic husband-and-wife team already has several collections under their belts. Their OCP debut, Del Pesebre a la Cruz (From the Manger to the Cross) surveys the life of Christ with a splashy, colorful, Caribbean sound. These 14 new songs include psalm-inspired devotionals, eucharistic songs, songs of praise, and music with Advent, Christmas and Easter themes. Their beautifully written original texts are entirely in Spanish. Recorded in Puerto Rico with top studio musicians, the CD brims with energy, joy and rhythm, all typical of that tropical island and its rich musical heritage. Styles include plena, joropo, bomba, guaracha, danza, nueva trova puertorriqueña, aguinaldo jíbaro, and others. Both gifted singers, Damaris and Diego take turns on lead vocals. The disc also features amazing performances on Latin drums and percussion, flute, accordion and guitar. "Nace en un Portal" is a tender ballad reveling in the birth of Christ. Urging us to "open your house to the child Jesus," it features mood-setting rain sticks and a delightfully unexpected tempo change. Marked by acrobatic flutes and potent syncopation, "Te Alabaré por Siempre" is a danceable song in praise of God's holy name. "Let us praise the Lord with the rhythm of dance and tambourines"
Other highlights include "Tú Eres el Alimento," a fast-paced eucharistic song in the style of "Aguinaldo Orocoveño." It features lyrics and raspy, impassioned vocals by Victoria Sanabria. Echoing Psalm 150, the refrain from "Al Ritmo de Danza y Pandero" makes a good summary of the entire collection: "Let us praise the Lord with the rhythm of dance and tambourines." The CD booklet includes a touching reflection by the composers. Of all God's gifts to us, they write, two stand out: Christ's manger and cross. Made from the "same tree," both are central to our salvation. With Del Pesebre a la Cruz, Damaris and Diego invite "all the earth" to sing praise for these splendid gifts. 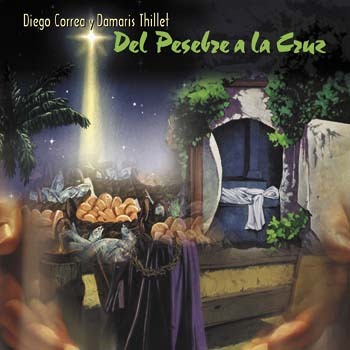 From Puerto Rican natives Damaris Thillet and her late husband Diego Correa, Del Pesebre a la Cruz (From the manger to the cross) surveys the life of Christ with a splashy, colorful, Caribbean sound. These 14 songs include psalm-inspired devotionals; eucharistic songs; songs of praise; and music with Advent, Christmas and Easter themes. Their beautifully written original texts are entirely in Spanish. Recorded in Puerto Rico with top studio musicians, the CD brims with energy, joy and rhythm, all typical of that tropical island and its rich musical heritage. Styles include plena, joropo, bomba, guaracha, danza, nueva trova puertorriqueña, aguinaldo jíbaro and others. The disc also features amazing performances on Latin drums and percussion, flute, accordion and guitar. “Nace en un Portal” is a tender ballad reveling in the birth of Christ. Urging us to “open your house to the child Jesus,” it features mood-setting rain sticks and a delightfully unexpected tempo change. Marked by acrobatic flutes and potent syncopation, “Te Alabaré por Siempre” is a danceable song in praise of God’s holy name. With Del Pesebre a la Cruz, Damaris and Diego invite “all the earth” to sing praise for the splendid gifts of the manger and the cross.